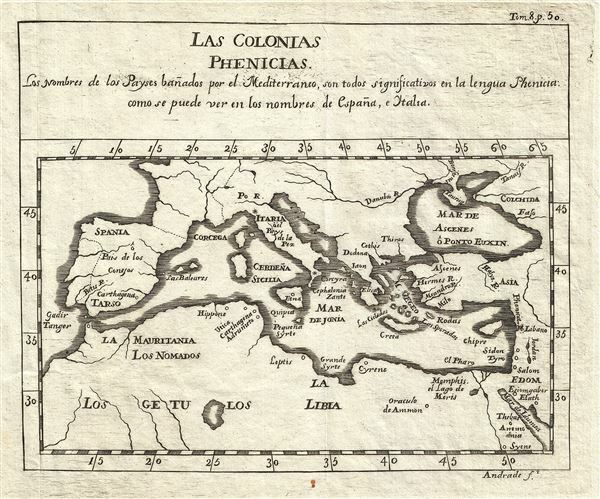 This is an interesting 1754 map of the Phoenician colonies along the Mediterranean coast by Gabriel Ramirez. Centered on the Mediterranean Sea, it covers from Portugal east as far as Arabia, including the Barbary Coast and the Black Sea. Phoenicia, according to some scholars, was an ancient civilization along the eastern coast of the Mediterranean. Believed to be of Semitic origin, the Phoenicians (or Canaanites, as they might have called themselves), most likely appeared in the region about 3000 BC. They were notable maritime merchants and traders who colonized most of the Mediterranean Coast by the late eight century. This map identifies some of the important Phoenician cities and colonies including Tyre and Sidon, among others. This map was originally prepared in French by Abbot M. Pluche and translated into Castilian Spanish. Engraved by Jose Andrade for publication in Volume VII, Part 4 of D. Gabriel Ramirez's Espectaculo de la Naturaleza, O Conversaciones a Cerca de Las Particularidades de la Historia Natural. Ramirez, G., Espectaculo de la Naturaleza, O Conversaciones a Cerca de Las Particularidades de la Historia Natural, Volume 7, Part 2, 1754. Very good. Minor wear along original fold lines. Original platemarks visible. Blank on verso.